The Republic of Korea, commonly called South Korea, is a democratic ally of the U.S. in East Asia. Its capital is Seoul, and it shares a border—the most heavily fortified border in the world—with North Korea. South Korea was formed in 1945 after the Japanese colonial control was ended, and the Communists took control of the north, dividing Korea along the 38th parallel according to an agreement between the U.S. and the Soviet Union. South Korea, a robust democracy since 1987, has embraced the free market and grown to become the world's 13th-largest economy, a leader in consumer electronics and home to the fastest internet connections on the planet. Area: 98,477 km2. (38,022 sq. mi. ); about the size of Indiana. Cities (2005): Capital--Seoul (10.3 million). Other major cities—Busan (3.7 million), Daegu (2.5 million), Incheon (2.6 million), Gwangju (1.4 million), Daejeon (1.5 million), Ulsan (1.0 million). Terrain: Partially forested mountain ranges separated by deep, narrow valleys; cultivated plains along the coasts, particularly in the west and south. Korea's population is one of the most ethnically and linguistically homogenous in the world. Except for a small Chinese community (about 20,000), virtually all Koreans share a common cultural and linguistic heritage. With 48.85 million people, South Korea has one of the world's highest population densities. Major population centers are located in the northwest, southeast, and in the plains south of the Seoul-Incheon area. Korea has experienced one of the largest rates of emigration, with ethnic Koreans residing primarily in China (1.9 million), the United States (1.52 million), Japan (681,000), and the countries of the former Soviet Union (450,000). The Korean language is related to Japanese and Mongolian. Although it differs grammatically from Chinese and does not use tones, a large number of Chinese cognates exist in Korean. Chinese ideograms are believed to have been brought into Korea sometime before the second century BC. The learned class spoke Korean, but read and wrote Chinese. A phonetic writing system ("hangul") was invented in the 15th century by King Sejong to provide a writing system for commoners who could not read classical Chinese. Modern Korean uses hangul almost exclusively with Chinese characters in limited use for word clarification. Approximately 1,300 Chinese characters are used in modern Korean. English is taught as a second language in most primary and secondary schools. Chinese and Japanese are widely taught at secondary schools. Population annual growth rate (2006): 0.42%. Ethnic groups: Korean; small Chinese minority. Religions: Christianity, Buddhism, Shamanism, Confucianism, Chondogyo. Education: Years compulsory—9. Enrollment—11.5 million. Attendance—middle school 99%, high school 95%. Literacy—98%. Health (2006): Infant mortality rate—6.16/1,000. Life expectancy—77.0 yrs (men 73.6 yrs. ; women 80.8 yrs). Work force (2005): 23.53 million. Services—67.2%; mining and manufacturing—26.4%; agriculture—6.4%. According to 2005 census data, the% ages of adherents to the predominant religious communities are: Buddhist, 22.8%; Protestant, 18.3%; and Roman Catholic, 10.9% . No official figures were available on the membership of other religious groups, which include Jehovah's Witnesses, the Church of Jesus Christ of Latter-day Saints (Mormons), Seventh-day Adventist Church, Daesun Jinrihoe, Unification Church, and Islam. According to Gallup Korea's 2004 survey on the state of religion in the country, 36% of those who practiced a faith reported that they attended religious services or rituals at a church or temple more than once a week, 11% attended two to three times per month, 21% attended once or twice a year, and 4.9% did not attend services. Of those who attended more than once a week, Protestants had the highest attendance rate at 71%, Catholics 43%, and Buddhists 3.5%. The Government observes Buddha's Birthday and Christmas as national holidays. The Government does not permit religious instruction in public schools. Private schools are free to conduct religious activities. Religious leaders regularly met both privately and under government auspices to promote mutual understanding and tolerance. The media gave public meetings wide and favorable coverage. For example, the Korean Council of Religious Leaders holds an annual event, the Republic of Korea Religious Culture Festival, which aims to promote reconciliation and mutual understanding among religious groups. The most recent festival, which was held on October 20, 2007, in Seoul, was attended by the Jogye Order of Korean Buddhism, Christian Churches of Korea, Won Buddhism, the Korea Religious Council, and the Catholic Church, among others. 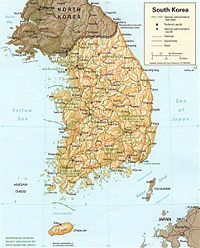 The Republic of Korea (commonly known as "South Korea") is a republic with powers nominally shared among the presidency, the legislature, and the judiciary, but traditionally dominated by the president. The president is chief of state and is elected for a single term of 5 years. The 299 members of the unicameral National Assembly are elected to 4-year terms. In the upcoming general elections on April 9, 2008, a total of 245 members will be elected from single-seat districts and 54 members will be chosen by proportional representation. South Korea's judicial system comprises a Supreme Court, appellate courts, and a Constitutional Court. The judiciary is independent under the constitution. The country has nine provinces and seven administratively separate cities—the capital of Seoul, along with Busan, Daegu, Daejeon, Gwangju, Incheon and Ulsan. Political parties include the Grand National Party (GNP), United Democratic Party (UDP), Liberal Forward Party (LFP), and Democratic Labor Party (DLP). Suffrage is universal at age 19 (lowered from 20 in 2005). In August 1991, South Korea joined the United Nations along with North Korea and is active in most UN specialized agencies and many international forums. The Republic of Korea also hosted major international events such as the 1988 Summer Olympics, the 2002 World Cup Soccer Tournament (co-hosted with Japan), and the 2002 Second Ministerial Conference of the Community of Democracies. Economic considerations have a high priority in Korean foreign policy. The R.O.K. seeks to build on its economic accomplishments to increase its regional and global role. It is a founding member of the Asia-Pacific Economic Cooperation (APEC) forum and chaired the organization in 2005. The Republic of Korea maintains diplomatic relations with more than 170 countries and a broad network of trading relationships. The United States and Korea are allied by the 1953 Mutual Defense Treaty. Korea and Japan coordinate closely on numerous issues. This includes consultations with the United States on North Korea policy. For almost 20 years after the 1950-53 Korean War, relations between North and South Korea were minimal and very strained. Official contact did not occur until 1971, beginning with Red Cross contacts and family reunification projects in 1985. In the early 1990s, relations between the two countries improved with the 1991 South-North Basic Agreement, which acknowledged that reunification was the goal of both governments, and the 1992 Joint Declaration of Denuclearization. However, divergent positions on the process of reunification and North Korean weapons programs, compounded by South Korea's tumultuous domestic politics and the 1994 death of North Korean leader Kim Il-sung, contributed to a cycle of warming and cooling of relations. Kim Jong-il of North Korea meets South Korean President Kim Dae-jung, 2000. Relations improved again following the 1997 election of Kim Dae-jung. His "Sunshine Policy" of engagement with the D.P.R.K. set the stage for the historic June 2000 inter-Korean summit between President Kim and North Korean leader Kim Jong-il. President Kim was awarded the Nobel Peace Prize in 2000 for the policy, but the prize was somewhat tarnished by revelations of a $500 million "payoff" to North Korea that immediately preceded the summit. Relations again became tense following the October 2002 North Korean acknowledgement of a covert program to enrich uranium for nuclear weapons. Following this acknowledgement, the United States, along with the People's Republic of China, proposed multilateral talks among the concerned parties to deal with this issue. At the urging of China and its neighbors, the D.P.R.K. agreed to meet with China and the United States in April 2003. In August of that year, the D.P.R.K. agreed to attend Six-Party Talks aimed at ending the North's pursuit of nuclear weapons that added the Republic of Korea, Japan, and Russia to the table. Two more rounds of Six-Party Talks between the United States, the Republic of Korea, Japan, China, and the D.P.R.K. were held in February and June 2004. At the third round, the United States put forward a comprehensive proposal aimed at completely, verifiably, and irreversibly eliminating North Korea's nuclear weapons programs. A fourth round of talks was held in two sessions spanning a period of 20 days between July and September 2005. All parties agreed to a Joint Statement of Principles on September 19, 2005, in which, among other things, the D.P.R.K. committed to "abandoning all nuclear weapons and existing nuclear programs and returning, at an early date, to the Treaty on the Non-Proliferation of Nuclear Weapons and to IAEA safeguards." The Joint Statement also committed the United States and other parties to certain actions as the D.P.R.K. denuclearized. The United States offered a security assurance, specifying that it had no nuclear weapons on R.O.K. territory and no intention to attack or invade the D.P.R.K. with nuclear or other weapons. Finally, the United States and the D.P.R.K., as well as the D.P.R.K. and Japan, agreed to undertake steps to normalize relations, subject to their respective bilateral policies. On October 9, 2006, North Korea announced a successful nuclear test, verified by the United States on October 11. In response, the United Nations Security Council, citing Chapter VII of the UN Charter, unanimously adopted Resolution 1718, condemning North Korea's action and imposing sanctions on certain luxury goods and trade of military units, weapons of mass destruction (WMD)-related parts, and technology transfers. The Six-Party Talks resumed in December 2006 after a 13-month hiatus. Following a bilateral meeting between the United States and D.P.R.K. in Berlin in January 2007, another round of Six-Party Talks was held in February 2007. On February 13, 2007, the parties reached an agreement on "Initial Actions for the Implementation of the Joint Statement" in which North Korea agreed to shut down and seal its Yongbyon nuclear facility, including the reprocessing facility, and to invite back International Atomic Energy Agency (IAEA) personnel to conduct all necessary monitoring and verification of these actions. The other five parties agreed to provide emergency energy assistance to North Korea in the amount of 50,000 tons of heavy fuel oil (HFO) in the initial phase (within 60 days) and the equivalent of up to 950,000 tons of HFO in the next phase of North Korea's denuclearization. The six parties also established five working groups to form specific plans for implementing the Joint Statement in the following areas: denuclearization of the Korean Peninsula, normalization of D.P.R.K.-U.S. relations, normalization of D.P.R.K.-Japan relations, economic and energy cooperation, and a Northeast Asia peace and security mechanism. All parties agreed that the working groups would meet within 30 days of the agreement, which they did. The agreement also envisions the directly-related parties negotiating a permanent peace regime on the Korean Peninsula at an appropriate separate forum. As part of the initial actions, North Korea invited IAEA Director General ElBaradei to Pyongyang in early March for preliminary discussions on the return of the IAEA to the D.P.R.K. The sixth round of Six-Party Talks took place on March 19–23, 2007. The parties reported on the first meetings of the five working groups. At the invitation of the D.P.R.K., Assistant Secretary of State Christopher Hill visited Pyongyang in June 2007 as part of ongoing consultations with the six parties on implementation of the Initial Actions agreement. In July 2007, the D.P.R.K. shut down the Yongbyon nuclear facility, as well as an uncompleted reactor at Taechon, and IAEA personnel returned to the D.P.R.K. to monitor and verify the shut-down and to seal the facility. Concurrently, the R.O.K., China, United States, and Russia initiated deliveries of approximately 50,000 metric tons of HFO per month, with the R.O.K. completing delivery of the first tranche of 50,000 metric tons in August, China the second in September, the United States the third in November, and Russia the fourth in January. These four parties are expected to continue to provide monthly shipments of HFO as the D.P.R.K. continues to implement denuclearization steps. All five working groups met in August and September to discuss detailed plans for implementation of the next phase of the Initial Actions agreement, and the D.P.R.K. invited a team of experts from the United States, China, and Russia to visit the Yongbyon nuclear facility in September 2007 to discuss specific steps that could be taken to disable the facility. The subsequent September 27–30 Six-Party plenary meeting resulted in the October 3, 2007 agreement on "Second-Phase Actions for the Implementation of the Joint Statement." Demilitarized Zone of Korea, Imjingang, 2005. Under the terms of the October 3 agreement, the D.P.R.K. agreed to disable all existing nuclear facilities subject to abandonment under the September 2005 Joint Statement and the February 13 agreement. The parties agreed to complete by December 31, 2007 a set of disablement actions for the three core facilities at Yongbyon—the 5-MW(e) Experimental Reactor, the Radiochemical Laboratory (Reprocessing Plant), and the Fresh Fuel Fabrication Plant—with oversight from a team of U.S. experts, The D.P.R.K. also agreed to provide a complete and correct declaration of all its nuclear programs in accordance with the February 13 agreement by December 31, 2007 and reaffirmed its commitment not to transfer nuclear materials, technology, or know-how. In November 2007, the D.P.R.K. began to disable the three core facilities at Yongbyon and complete most of the agreed disablement actions by the end of the year. Due to health and safety concerns, disablement activities at the 5-MW(e) reactor continued beyond December 31, 2007. Assistant Secretary of State Christopher Hill visited Pyongyang again in December 2007 as part of ongoing consultations on the implementation of Second-Phase actions and carried with him a letter from the President of the United States to Kim Jong-il. The D.P.R.K. missed the December 31 deadline to provide a complete and correct declaration, but efforts to secure a declaration continued into January 2008. The United States believes that the question of peace and security on the Korean Peninsula is, first and foremost, a matter for the Korean people to decide. Gen. MacArthur statue in Jayu Park, Incheon. Under the 1953 U.S.-R.O.K. Mutual Defense Treaty, the United States agreed to help the Republic of Korea defend itself against external aggression. Since that time in support of this commitment, the United States has maintained military personnel in Korea, including the Army's Second Infantry Division and several Air Force tactical squadrons. To coordinate operations between these units and the over 680,000-strong Korean armed forces, a Combined Forces Command (CFC) was established in 1978. The head of the CFC also serves as Commander of the United Nations Command (UNC) and U.S. Forces Korea (USFK). The current commander is General Burwell Baxter "B.B." Bell. Several aspects of the security relationship are changing as the U.S. moves from a leading to a supporting role. In 2004, agreement was reached on the return of the Yongsan base in Seoul—as well as a number of other U.S. bases—to the R.O.K. and the eventual relocation of all U.S. forces to south of the Han River. In addition, the U.S. and R.O.K. agreed to move 12,500 of the 37,500 U.S. troops out of Korea by 2008. At the same time U.S. troops are being redeployed from Korea, the U.S. will bolster combined U.S./R.O.K. deterrent and defense capabilities by providing $11 billion in force enhancements in Korea and at regional facilities over the next four years. As Korea's economy has developed, trade has become an increasingly important aspect of the U.S.-R.O.K. relationship. The U.S. seeks to improve access to Korea's expanding market and increase investment opportunities for American business. The implementation of structural reforms contained in the IMF's 1998 program for Korea improved access to the Korean market, although a range of serious sectoral and structural barriers remained. Korean leaders appear determined to successfully manage the complex economic relationship with the United States and take a more active role in international economic fora as befits Korea's status as a major trading nation. On April 1, 2007, the U.S. and Korea successfully concluded Free Trade Agreement (FTA) negotiations. Eight rounds of formal talks held over the course of 10 months culminated in a deal that will "further enhance the strong United States-Korea partnership, which has served as a force for stability and prosperity in Asia," as stated by President Bush. The agreement was signed by U.S. Trade Representative Susan Schwab and South Korean Trade Minister Kim Hyun-chong on June 30, 2007 and is currently awaiting ratification in the U.S. Congress and the Korean National Assembly. The FTA is expected to stimulate billions of dollars in trade through the removal of trade barriers and increased investment. The Republic of Korea's economic growth over the past several decades has been spectacular. Per capita GNP, only $100 in 1963, is approaching $20,000. South Korea is now the United States' seventh-largest trading partner and is the 13th-largest economy in the world. In recent years, Korea's economy moved away from the centrally planned, government-directed investment model toward a more market-oriented one. Korea bounced back from the 1997-98 Asian financial crisis with some International Monetary Fund (IMF) assistance, but based largely on extensive financial reforms that restored stability to markets. These economic reforms, pushed by President Kim Dae-jung, helped Korea maintain one of Asia's few expanding economies, with growth rates of 10% in 1999 and 9% in 2000. The slowing global economy and falling exports slowed growth to 3.3% in 2001, prompting consumer stimulus measures that led to 7.0% growth in 2002. Consumer over-shopping and rising household debt, along with external factors, slowed growth to near 3% again in 2003. Economic performance in 2004 improved to 4.6% due to an increase in exports, and remained at or above 4% in 2005, 2006, and 2007. Economists are concerned that South Korea's economic growth potential has fallen because of a rapidly aging population and structural problems that are becoming increasingly apparent. Foremost among these structural concerns is the rigidity of South Korea's labor regulations, the need for more constructive relations between management and workers, the country's underdeveloped financial markets, and a general lack of regulatory transparency. Restructuring of Korean conglomerates ("chaebols") and creating a more liberalized economy with a mechanism for bankrupt firms to exit the market are also important unfinished reform tasks. Korean policy makers are increasingly worried about diversion of corporate investment to China and other lower wage countries. By 2020, South Korea plans on eliminating coins, a move toward a Cashless society. Nominal GDP: 2005, $787.5 billion; 2006 est., $897.4 billion. GDP growth rate: 2004, 4.7%; 2005, 4.0%; 2006 est. 5.0%; 2007 est. 4.8%. Per capita GNI (2006): $18,392. Consumer price index: 2004, 3.6%; 2005, 2.8%; 2006, 2.2%. Natural resources: Limited coal, iron ore, limestone, kaolinite, and graphite. Agriculture, including forestry and fisheries: Products—rice, vegetables, fruit, root crops, barley; cattle, pigs, chickens, milk, eggs, fish. *Arable land—17% of land area. Industry: Types—Electronics and electrical products, telecommunications, motor vehicles, shipbuilding, mining and manufacturing, petrochemicals, industrial machinery, steel. Trade (2007 est. ): Exports--$386.6 billion f.o.b. : electronic products (semiconductors, cellular phones and equipment, computers), automobiles, machinery and equipment, steel, ships, petrochemicals. Imports--$359.5 billion f.o.b. : crude oil, food, machinery and transportation equipment, chemicals and chemical products, base metals and articles. Major markets (2006)--China (21.3%), U.S. (13.3%), Japan (8.1%), Hong Kong (5.9%). Major suppliers (2006)--Japan (16.8%), China (15.7%), U.S. (11%), Saudi Arabia (6.7%), U.A.E. 4.2%. Two-way trade between North and South Korea, legalized in 1988, hit almost $1.35 billion in 2006, much of it related to out-processing or assembly work undertaken by South Korean firms in the Kaesong Industrial Complex (KIC). A significant portion of the total also includes donated goods provided to the North as humanitarian assistance or as part of inter-Korean cooperation projects. According to R.O.K. figures, about 60% of the total trade consisted of commercial transactions, much of that based on processing-on-commission arrangements. The R.O.K. is North Korea's second-largest trading partner. Since the June 2000 North-South summit, North and South Korea have reconnected their east and west coast railroads and roads where they cross the DMZ and are working to improve these transportation routes. North and South Korea conducted tests of the east and west coast railroads on May 17, 2007 and began cross-border freight service between Kaesong in the D.P.R.K. and Munsan in the R.O.K. in December 2007. Much of the work done in North Korea has been funded by South Korea. The west coast rail and road are complete as far north as the KIC (six miles north of the DMZ), but little work is being done north of Kaesong. On the east coast, the road is complete but the rail line is far from operational. Since 2003, tour groups have been using the east coast road to travel from South Korea to Mt. Geumgang in North Korea, where cruise ship-based tours had been permitted since 1998. As of August 2007, 65 South Korean firms were manufacturing goods in the KIC, employing nearly 22,000 North Korean workers. Most of the goods are sold in South Korea; a small quantity is being exported to foreign markets. Ground was broken on the complex in June 2003, and the first products were shipped from the KIC in December 2004. Plans envision 250 firms employing 350,000 workers by 2012. R.O.K.-organized tours to Mt. Kumgang in North Korea began in 1998. Since then, more than a million visitors have traveled to Mt. Kumgang. Giant stone statue of Buddha in Gyeongju. The myth of Korea's foundation by the god-king Tangun in BC 2333 embodies the homogeneity and self-sufficiency valued by the Korean people. Korea experienced many invasions by its larger neighbors in its 2,000 years of recorded history. The country repelled numerous foreign invasions despite domestic strife, in part due to its protected status in the Sino-centric regional political model during Korea's Chosun dynasty (1392-1910). Historical antipathies to foreign influence earned Korea the title of "Hermit Kingdom" in the 19th century. With declining Chinese power and a weakened domestic posture at the end of the 19th century, Korea was open to Western and Japanese encroachment. In 1910, Japan began a 35-year period of colonial rule over Korea. As a result of Japan's efforts to supplant the Korean language and aspects of Korean culture, memories of Japanese annexation still recall fierce animosity and resentment, especially among older Koreans. Nevertheless, import restrictions on Japanese movies, popular music, fashion, and the like have been lifted, and many Koreans, especially the younger generations, eagerly follow Japanese pop culture. Aspects of Korean culture, including television shows and movies, have also become popular in Japan. Japan's surrender to the Allied Powers in 1945, signaling the end of World War II, only further embroiled Korea in foreign rivalries. Division at the 38th parallel marked the beginning of Soviet and U.S. trusteeship over the North and South, respectively. On August 15, 1948 the Republic of Korea (R.O.K.) was established, with Syngman Rhee as the first President. On September 9, 1948 the Democratic People's Republic of Korea (D.P.R.K.) was established under Kim Il Sung. On June 25, 1950, North Korean forces invaded South Korea. Led by the U.S., a 16-member coalition undertook the first collective action under United Nations Command (UNC). Following China's entry on behalf of North Korea later that year, a stalemate ensued for the final two years of the conflict. Armistice negotiations, initiated in July 1951, were ultimately concluded on July 27, 1953 at Panmunjom, in what is now the Demilitarized Zone (DMZ). The Armistice Agreement was signed by representatives of the Korean People's Army, the Chinese People's Volunteers, and the U.S.-led United Nations Command (UNC). Though the R.O.K. supported the UNC, it refused to sign the Armistice Agreement. A peace treaty has never been signed. The war left almost three million Koreans dead or wounded and millions of others homeless and separated from their families. In the following decades, South Korea experienced political turmoil under autocratic leadership. President Syngman Rhee was forced to resign in April 1960 following a student-led uprising. The Second Republic under the leadership of Chang Myon ended after only one year, when Major General Park Chung-hee led a military coup. Park's rule, which resulted in tremendous economic growth and development but increasingly restricted political freedoms, ended with his assassination in 1979. Subsequently, a powerful group of military officers, led by Lieutenant General Chun Doo Hwan, declared martial law and took power. Throughout the Park and Chun eras, South Korea developed a vocal civil society that led to strong protests against authoritarian rule. Composed primarily of students and labor union activists, protest movements reached a climax after Chun's 1979 coup and declaration of martial law. A confrontation in Gwangju in 1980 left at least 200 civilians dead. Thereafter, pro-democracy activities intensified even more, ultimately forcing political concessions by the government in 1987, including the restoration of direct presidential elections. In 1987, Roh Tae-woo, a former general, was elected president, but additional democratic advances during his tenure resulted in the 1992 election of a long-time pro-democracy activist, Kim Young-sam. Kim became Korea's first civilian elected president in 32 years. The 1997 presidential election and peaceful transition of power marked another step forward in Korea's democratization when Kim Dae-jung, a lifelong democracy and human rights activist, was elected from a major opposition party. The transition to an open, democratic system was further consolidated in 2002, when self-educated human rights lawyer, Roh Moo-hyun, won the presidential election on a "participatory government" platform. Most recently, South Koreans voted for a new president in December 2007. Former business executive and Mayor of Seoul Lee Myung-bak's 5-year term began with his inauguration on February 25, 2008. The national air carrier of the State is Korean Airlines. The most famous incident involving the airline is the shooting down by the Soviets of Korean Airlines Flight 007 near Moneron Island just west of the Soviet Sakhalin Island on Sept. 1, 1983. Among the 269 people on board this flight was a sitting conservative congressman (Democratic) from the state of Georgia, Larry McDonald, a younger cousin of General George Patton. Staunchly anti-communist, Larry McDonald, just three months earlier, had been elected the second head of the John Birch Society. Senator Jesse Helms was scheduled to also be aboard KAL 007 but was spared by boarding the sister flight for the trip from the U.S.to Korea, KAL 015. Both McDonald and Helms, with other congressmen, were on their way to Korea to celebrate the 30th year anniversary of the U.S.-Korea Mutual Defense Treaty. File available from the United States Federal Government . This page was last modified on 27 May 2018, at 15:52. This page has been accessed 30,377 times.